If you're looking for an adjustable, mobile, illuminated non-sound lectern that suits your needs, then you've come to the right place. Versatility is the key with these height adjustable lecterns. 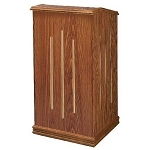 The 810 Oklahoma Sound Lectern Presentation Podium is suited to every speaker and environment. The spacious reading surface adjusts in height from 42" to 52" so it meets whatever height requirements you need it to for your presentation or speech. The podium is illuminated by a brass lamp and this lectern features a convenient digital time piece so that you can easily and subtly check the time. Four easy roll caster wheels are concealed under an elegant cabinet featuring gold appointments. This lectern is meant for large audiences of up to 2000 people, so it will be the right size for you. This lectern is currently at a really good deal so you do not want to miss out. 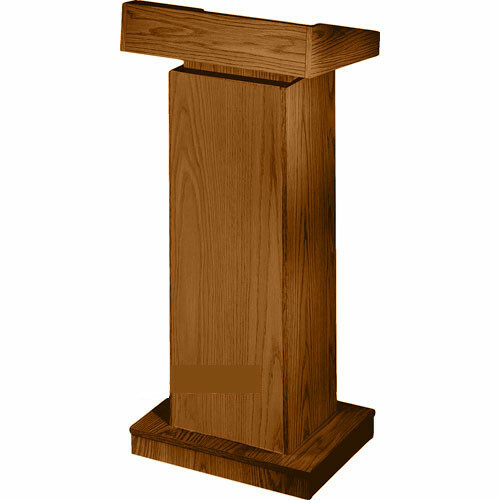 Buy your 810 Oklahoma Sound Adjustable Non-Sound Lectern Presentation Podium at an affordable price today! Weight:............ #800 - 78 lbs; #810 - 78 lbs. Competitive Edge Products, Inc. is an authorized distributor of the 810 Oklahoma Sound non-sound lectern. Fast Shipping: Orders for the National Public Seating 810 generally leave the warehouse within 1-2 business days. Delivery Details: This product ships directly from the warehouse in , . This item generally ships via FedEx and may not require a signature.